Hello Sunshine! 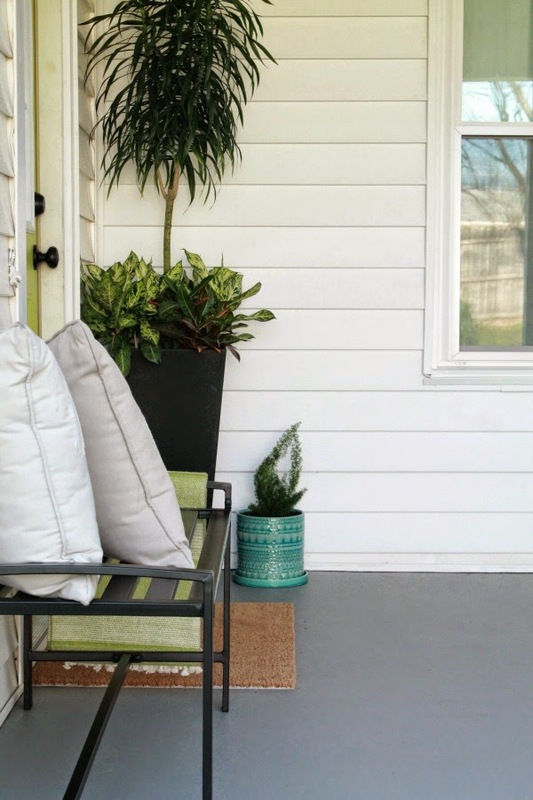 Thank you so much for all your wonderful comments on our colorful porch makeover, you know just how to make a girl smile! 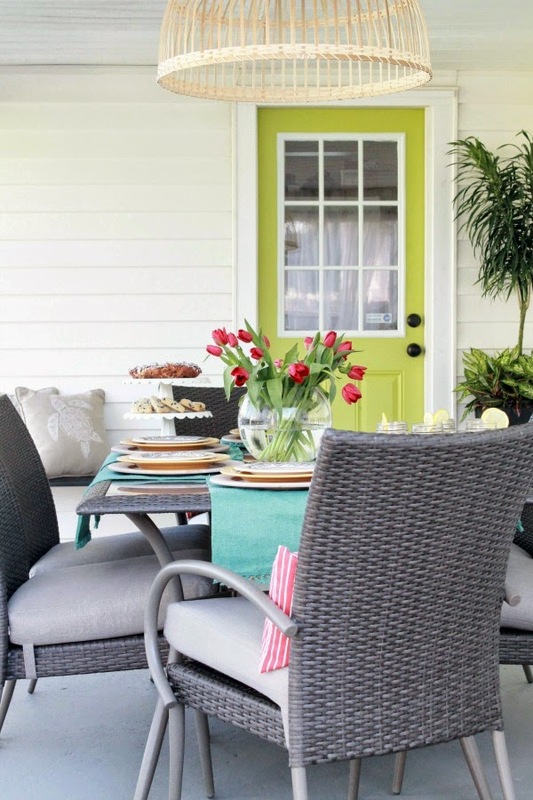 If you haven't had a chance to see our Home Depot Patio Style Challenge, you can see it HERE. 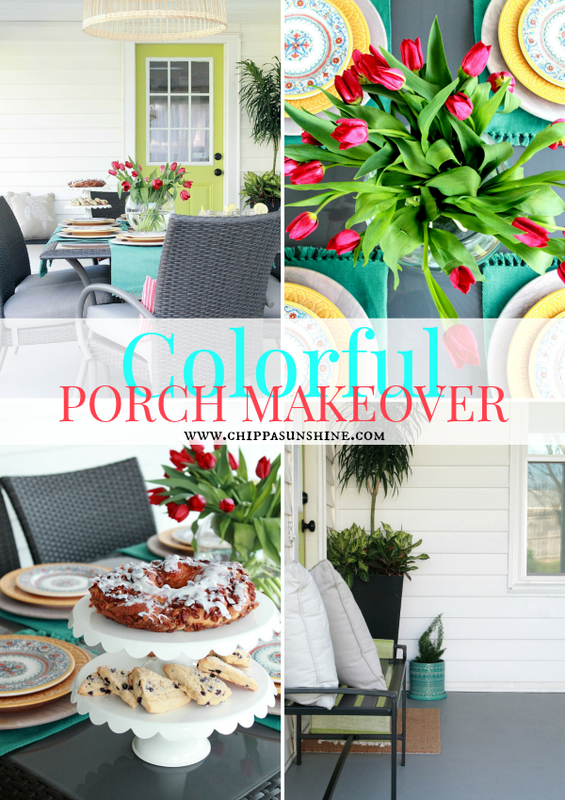 I'm sharing some more photos of our colorful porch makeover here today with a complete source list and a spring tablescape idea. I'll share a couple of tutorials I completed for our space in the upcoming weeks. With dirty footprints and spills of sweet tea, cake, and watermelon bound to happen I decided it best to forgo a rug. Cleanup of any spills is so much easier this way. For a more uniform look I refinished our cement floor and for a nice pop of color to an otherwise bland space, I painted the door a bright shade of green. 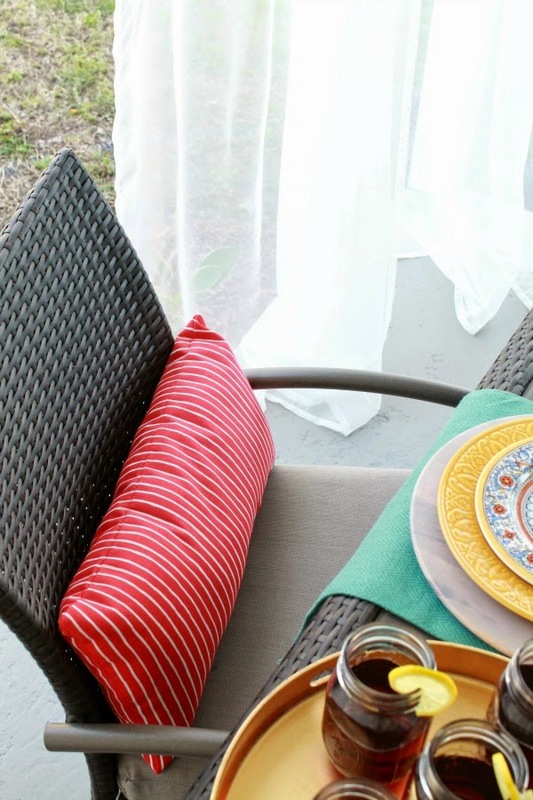 To complete our outdoor dining space, I hung curtains and a chandelier, added pillows, a bench for extra seating, and a few planters filled with interesting plants, cause as you know outdoors and plants go hand in hand! On a recent trip to Houston for spring break, I kept noticing these strange ferns everywhere. I had never seen one of these before and of course I had to bring one home with me. It's a foxtail fern and its right at home in its blue pot here in Nashville. 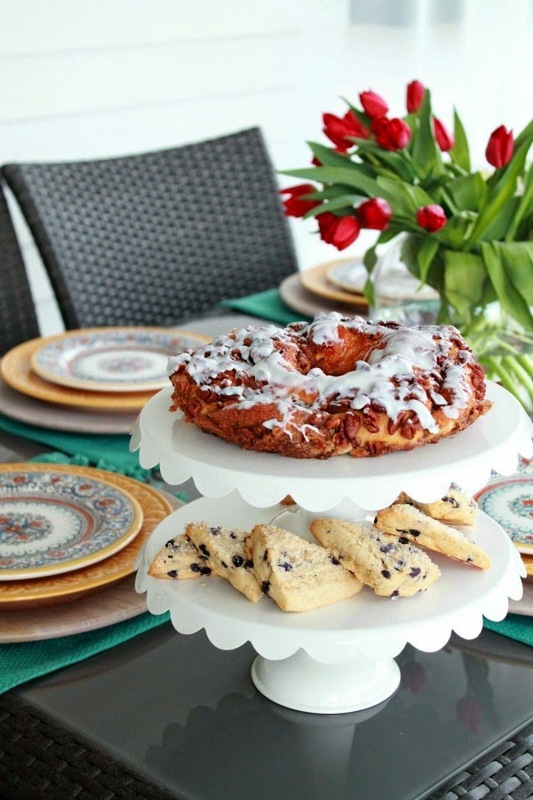 One thing I love about planning a party, a get-together with the girls or close friends is the table setting, oh and you can't forget the holidays! Choosing the napkins, chargers, plates, the silverware, tablecloth, I love it all. You can say I get it from my Grandma. She taught me as a little girl how to set a table and it stuck with me. I never set a table for regular dinner, heck we eat around the TV, but for any occasion I deem special you better believe I'm dressing the table. 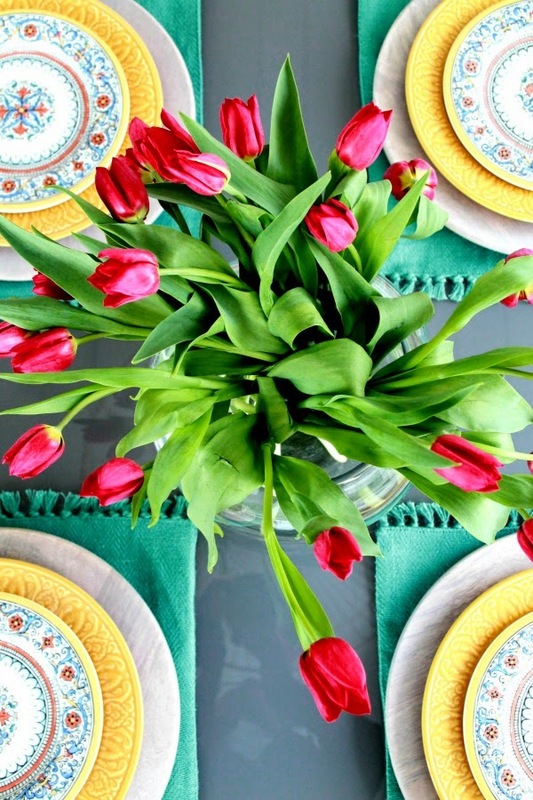 My idea of a simple spring tablescape is an eclectic place setting, no need to match, a set of bell jars filled with your favorite drink, mine is sweet tea, a couple of cake stands stacked on top of each other holding sweet, delicious treats, and a glass bowl filled with your favorite flowers. Easy peasy! Right! I hope you take advantage of the cool spring afternoons to go outside and enjoy your porch or patio. 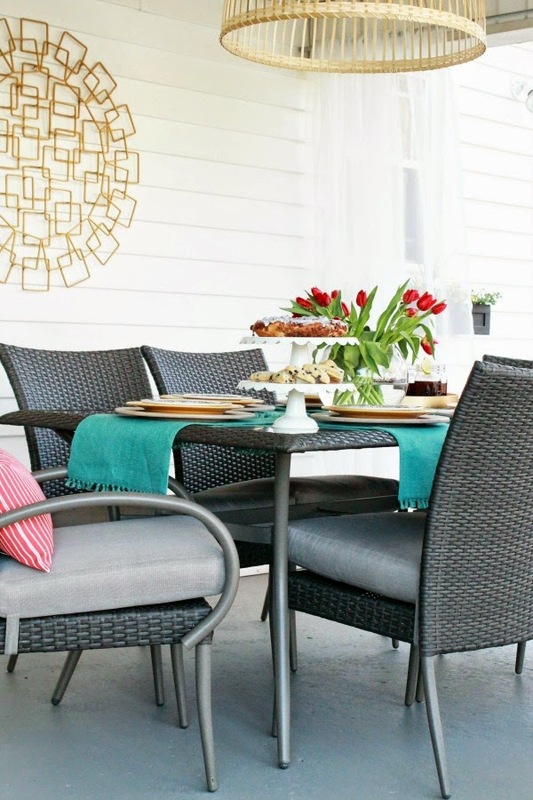 Go ahead and eat outside tonight! See ya soon! I feel like I really want to use that door color on my front door. It would look pretty with my dark green shutters. Darnetha, your porch is top notch! 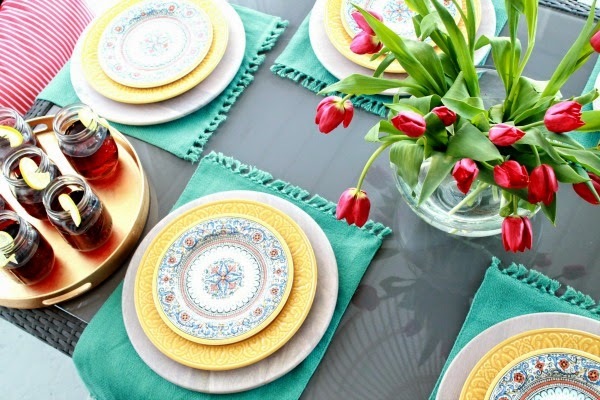 Love all the bright colors and patterns you used together. I bet it's a great spot to enjoy meals together. 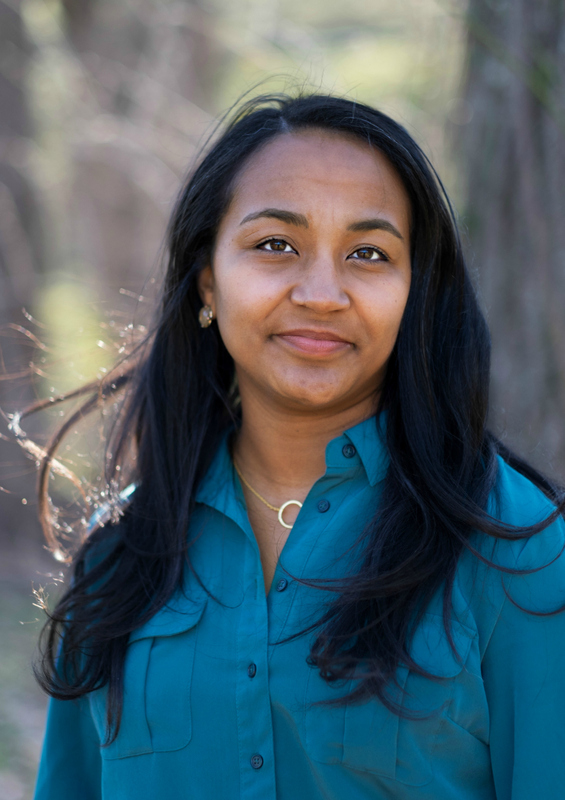 Everything is just perfect Darnetha! And thank you for letting us know what that fern is called! I love how you made an outdoor space feel like an indoor space. The colors are gorgeous!